Madagascar sunset moths (Chrysiridia rhipheus) are brightly colored moths native only to the island of Madagascar. Their unique beauty makes them a favorite of traditional jewelry makers and artists who use the moths' iridescent wings to create works of art. In addition to their beauty, there are several aspects that set Madagascar sunset moths apart from other moths. Madagascar sunset moths are diurnal, meaning, unlike most moths, they are active during the day. This habit, as well as the bright colors and shape of their wings, causes them to frequently be mistaken for swallowtail butterflies. During the daylight hours they can be seen flitting from one flower to another feeding on nectar. As adults, they show a strong preference for white flowers, although not for specific plants. They caterpillars, or larvae, of Madagascar sunset moths are much more picky in their feeding habits. They will only eat plants from the family Omphalea, which are toxic to most animals. They hatch from eggs laid only on the underside of the leaves of these plants. Upon hatching they consume the entire plant -- leaves, flowers and stems. Once that plant is decimated they move on to another of the same family. These caterpillars are easy to distinguish, as their bodies are white or shades of light yellow with black spots, and they have bright red feet. Madagascar sunset moths have only one means of defense -- they are poisonous. The toxins contained in the Omphalea plants are eaten by the caterpillars but not digested. Instead these toxins remain in their bodies through pupation and into adulthood. The result is a moth that is toxic to most predators. Their brightly colored wings may serve as a warning predators to leave them alone or suffer the consequences. By far the most noticeable distinguishing characteristic of Madagascar sunset moths is their appearance. 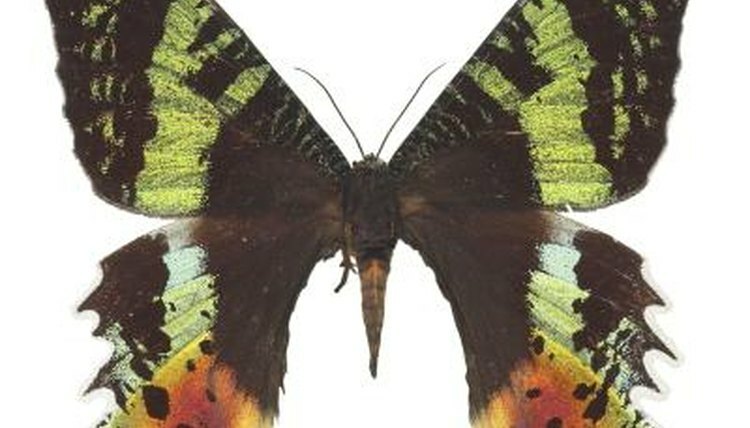 They are large moths, boasting a wingspan of 3 to 3 1/2 inches. It's their wings that really get them noticed. They are iridescent and appear to be in shades of black, red, green and blue. Every time the moths move their wings, the colors and patterns shift, creating a kaleidoscope effect. It's really just an optical illusion, though. Most of the of the moths' wings contain no pigment at all, and in subdued light they appear bland and unremarkable. The flashy colors are created by the curvature of the scales on their wings that reflect light in different angles, giving the appearance of color. What Does the Blue Morpho Caterpillar Look Like? What Type of Moth Does Not Have a Mouth?